Downloadable Link to the PDF will be available upon purchase. Limit 5 downloads. Download link expires in 30 days. Because of the size of the file, PDF files will be provided. Finding your soulmate and living happily together are at one and the same time one of life’s greatest challenges and prospects. Together with its companion volume “The Mystery of Marriage,” this book gives some of the deepest and particularly revealing insights into the nature of couplehood. This book approaches dating from the fresh perspective of a journey that both men and women enter in hope of uncovering their deepest creatives forces. With sensitivity to the essential differences between men and women, this book will help you appreciate the underlying motivations that move each to seek compansionship and matrimony. It also presents the first rigorous analysis of how the development of consciousness and the ability to make the right choices in life go hand-in-hand, stressing that your ability to appreciate the Divine nature of reality is a key factor in doing so. As such, the principles expounded can be applied to all areas of importance in life that involves difficult choices. 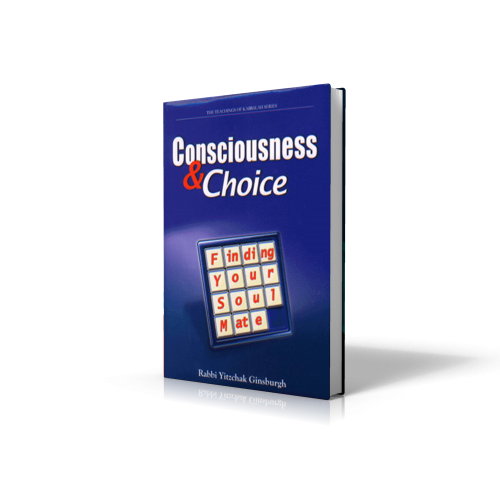 Consciousness & Choice includes a detailed Kabbalistic study of the ancient courtship custom known as “the Dance of the Maindens.” From this ancient ritual and its intricacies, Harav Ginsburgh uncovers the spiritual value of every motivating factor in searching for a spouse. Book sample available through Google Books Here.